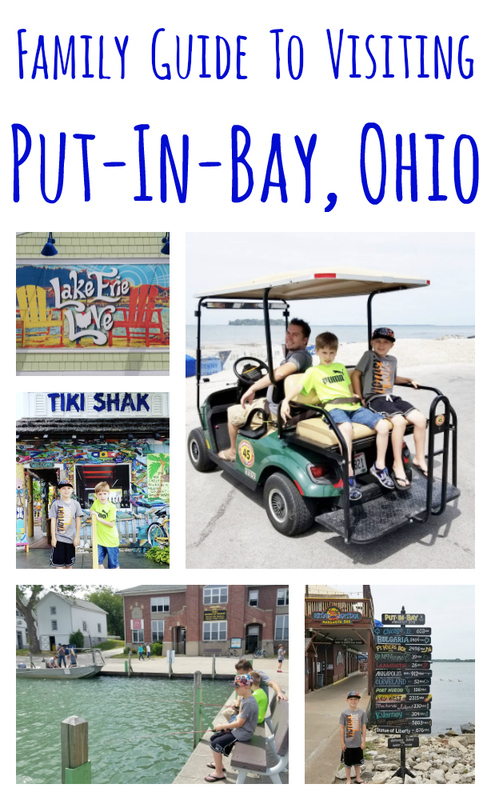 Last summer we went to Cedar Point and decided to spend an extra day exploring Put-In-Bay, Ohio, before we headed home to the Chicago suburbs. I am so glad we decided to extend our stay because that has been one of my favorite vacations to date. 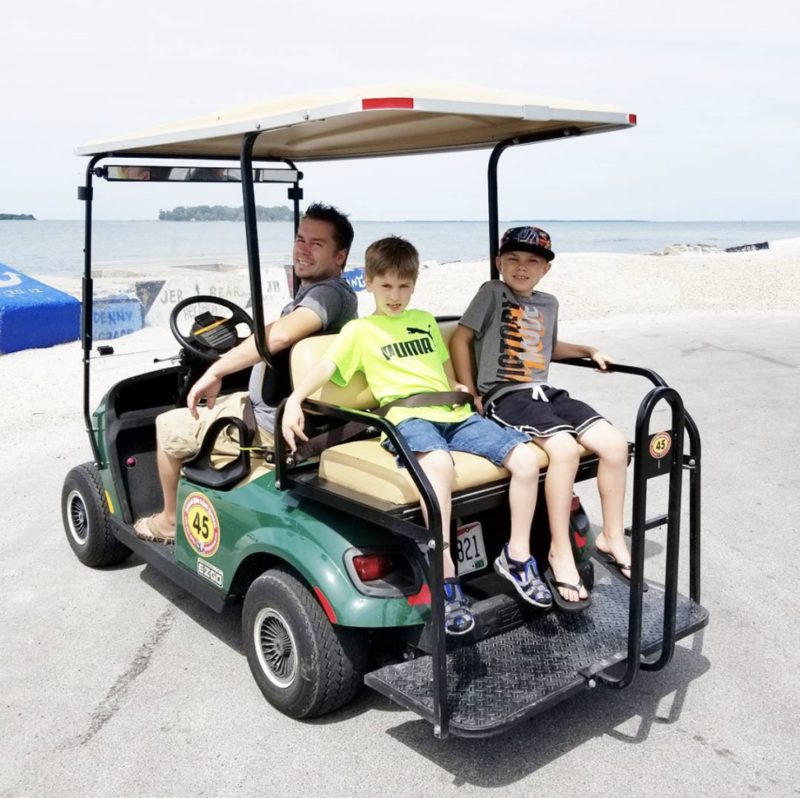 Put-In-Bay provides an atmosphere much like one you’d find in the Caribbean and it was just a nice family getaway spent relaxing and enjoying “island time”. If you need a break from busy sports schedules and the hectic daily grind, this is the place for you! To get to Put-In-Bay you need to take a ferry. We took a Miller Ferry from Sandusky, Ohio where we were staying. You can take a car along on the ferry but I’d suggest leaving it behind and just renting a golf cart to get around. It was pretty affordable and not only is it convenient, it’s fun to drive around in. 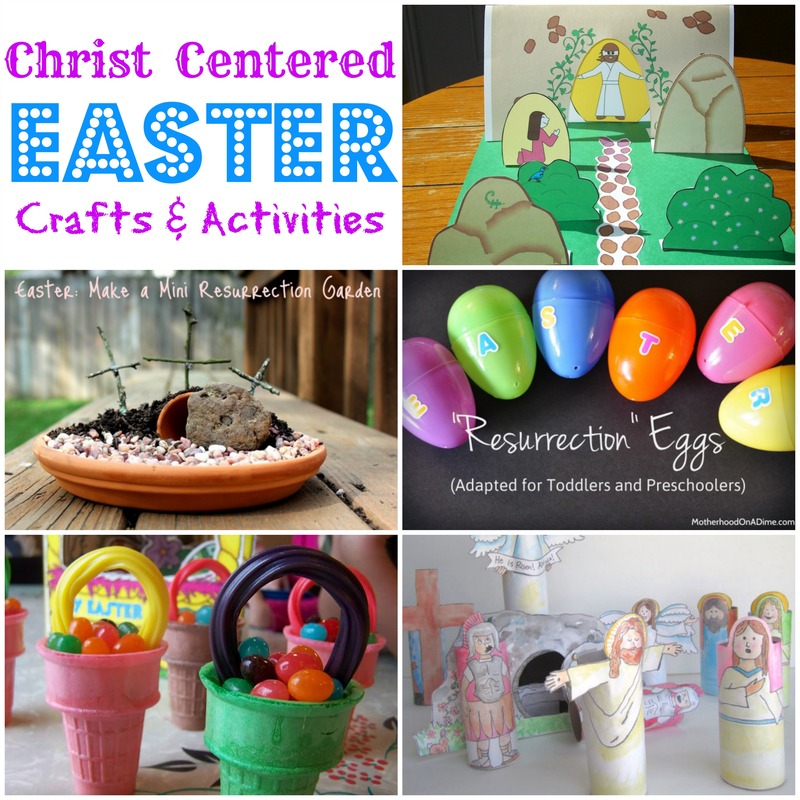 We loved this FREE activity! 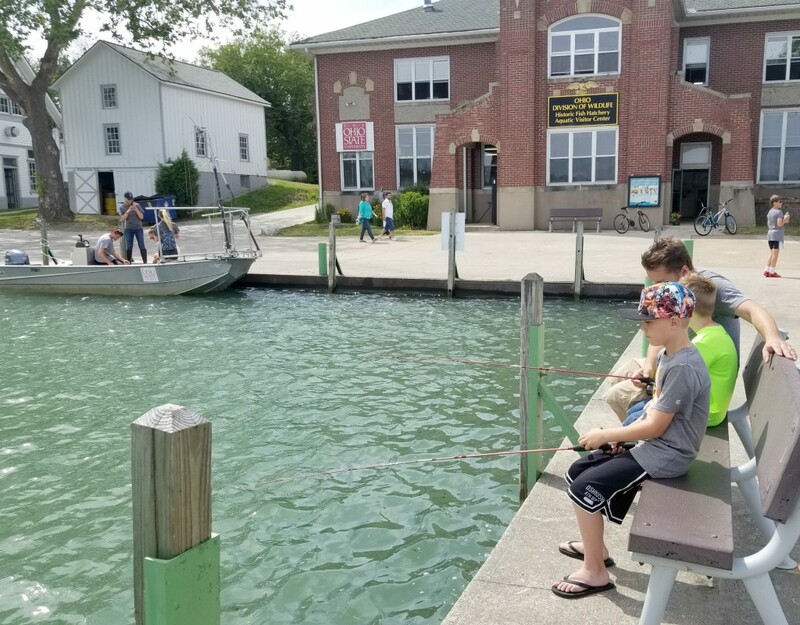 Families can learn more about Lake Erie by exploring its rich history and experiencing science up close at the Aquatic Visitors Center. Afterwards, borrow some fishing poles and bait and go fishing off the pier! Learn more here. Any place with a playground is a “must visit” in my kids’ minds! DeRivera Park is a large shaded park right in the heart of the little downtown area. 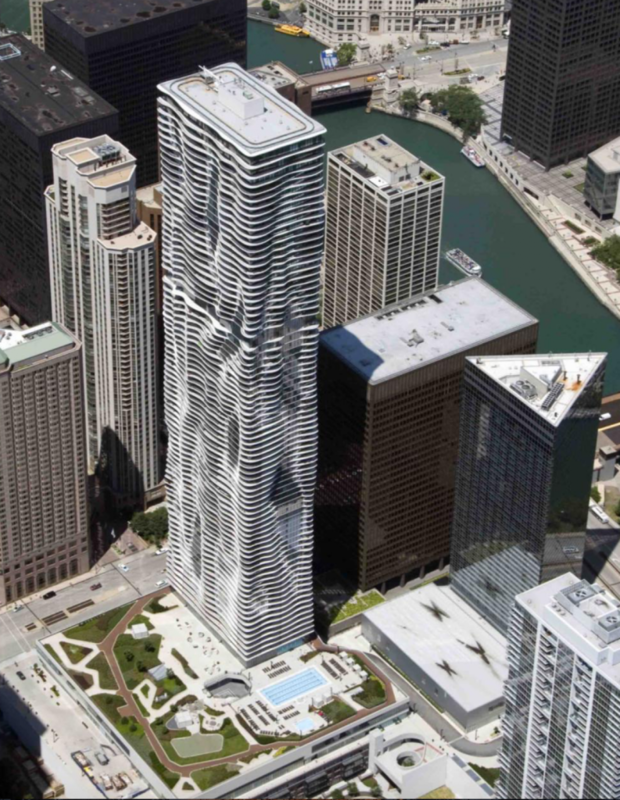 Children will love the large playground while parents will love the water views. There are also some historic landmarks in the area that are interesting to learn about. It’s no secret that sitting near the water, eating on an outdoor patio, is one of my favorite things to do so when I saw this adorable, colorful patio area I just knew we had to stop for lunch. 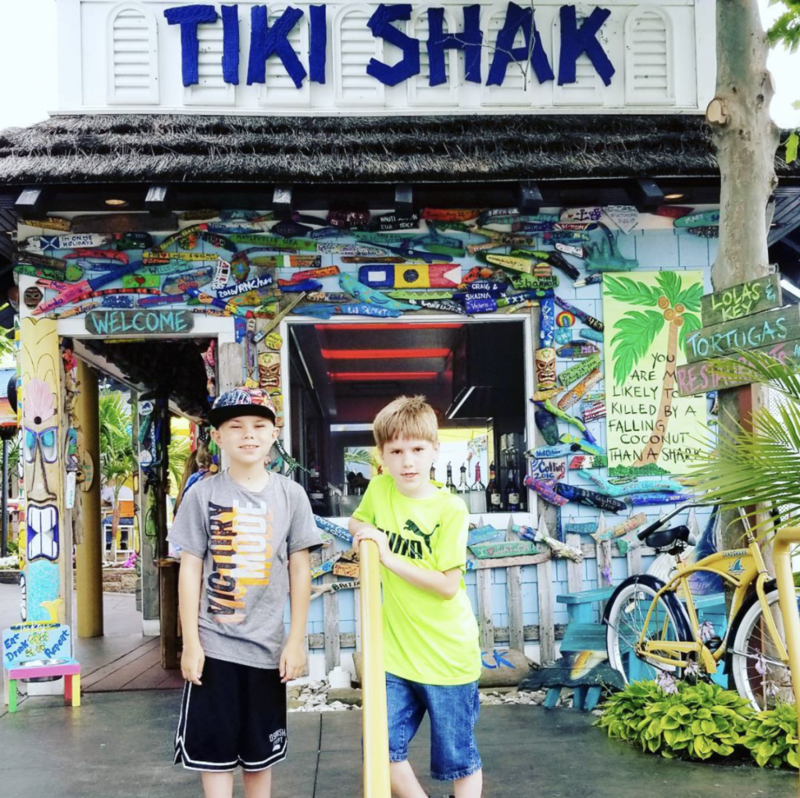 Waterfront views, delicious food, and music that makes you feel like you are vacationing in the Florida Keys makes this place top of my list for mealtime. Perry’s Cave Family Fun Center has enough activities to keep a family busy for almost a whole day. From exploring a cave to gemstone mining to playing mini-golf to visiting a butterfly house to checking out antique cars, the whole family will find something they love! 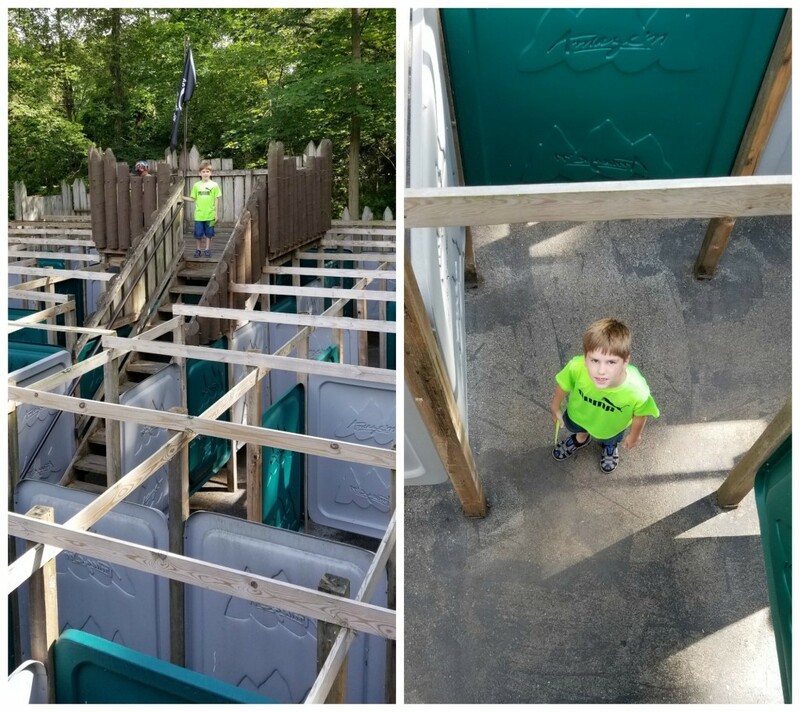 My boys favorite activity there was Fort aMAZE’n, a giant maze they enjoyed racing the clock to find their way out of. Learn more about all Perry’s Cave Family Fun Center has to offer here. Walking along the lakefront was a relaxing way to spend the morning and I enjoyed going into shops that were around the middle of the town as well. If it’s hot out make sure to stop by Dairy Isle for a cool treat to enjoy while you walk around town! Those with a sweet tooth will want to visit the Chocolate Museum and enjoy a treat from their cafe which they can enjoy outside in the picnic area. I thought it was interesting to walk around the museum area but the boys just wanted to hurry through to check out the array of chocolatey goodness that they offered in their cafe. I loved every minute we spent in Put-In-Bay, Ohio and am so glad we made the trip over to the island. Have you ever visited? 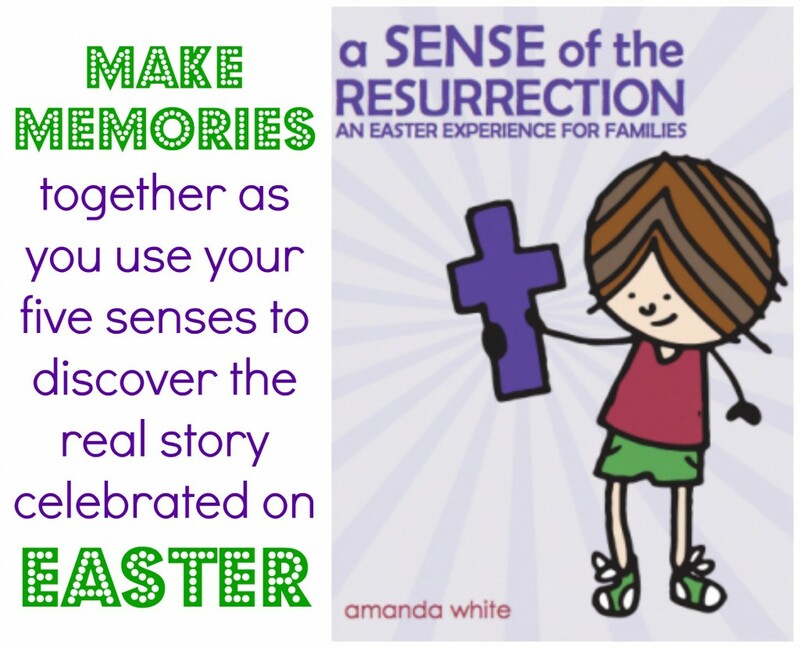 I’d love to hear what other things your family enjoyed doing if so! Thanks to Radisson Blu Aqua for hosting my family for a complimentary stay at their hotel. 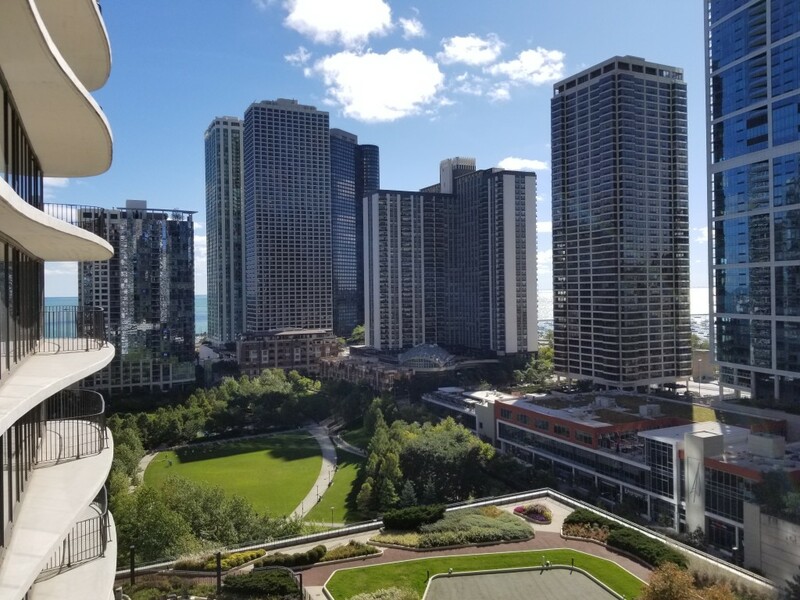 I’m always on the lookout for getaways close to where we live in the Chicago suburbs and our recent stay at the Radisson Blu Aqua did not dissapoint. I was happy to find so much to do inside the hotel which makes it perfect for winter staycations. 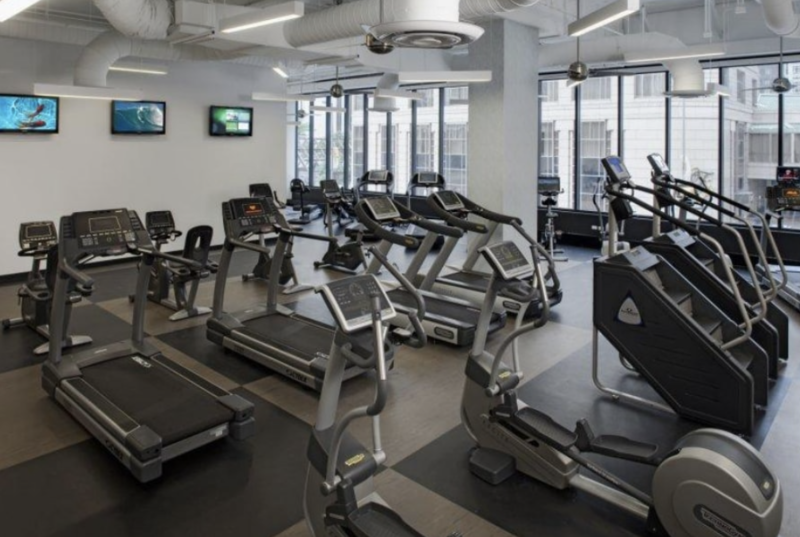 Best of all, it’s located right in the heart of Chicago, close to Michigan Avenue, Millennium Park and other popular tourist attractions. When we first arrived at the Radisson Blu Aqua I was thrilled to be able to see bits of the lake from my room. A water view is always top of my list anytime I travel! I also had a nice view of the hotel’s rooftop courtyard along with Millennium Park’s concert shelter. While a water view is at the top of my list, so is a nice room. 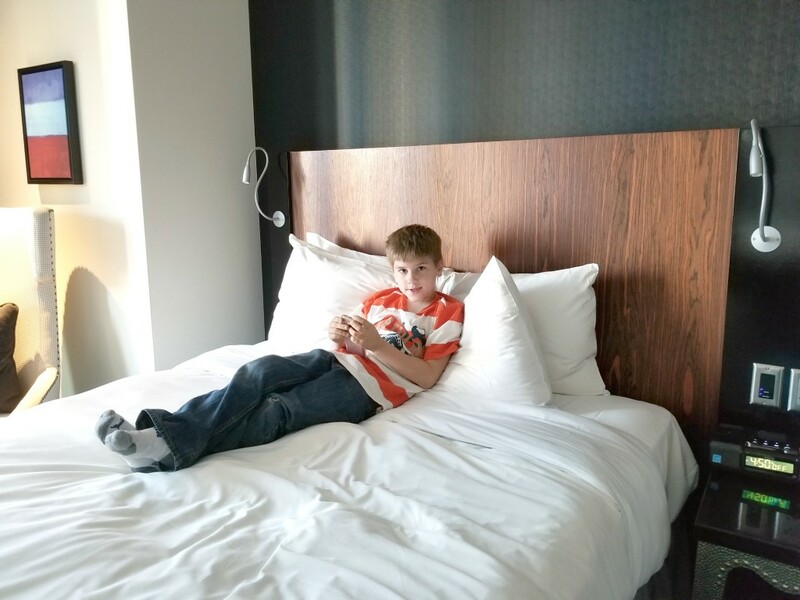 When we travel we often have to take breaks in our room in between activities to give Lucas downtime, so we spend a lot more time in our room than the typical family might. The rooms at the hotel were nicely furnished with comfortable beds and a fabulous rain shower in the bathroom. Once we relax a bit in the room the boys typically want to go to the pool. 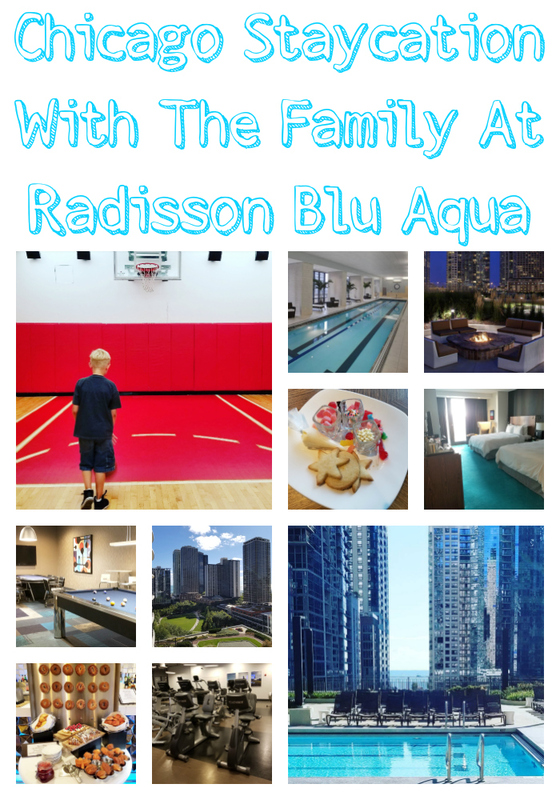 We discovered the Radisson Blu Aqua has two pools, a large outdoor pool and a smaller indoor lap pool. Since it was too cold for an outoor swim, the boys played in the indoor one. There is also a hot tub which is nice for relaxing after a long day. After swimming we went to explore the other ammeneties the hotel offered. 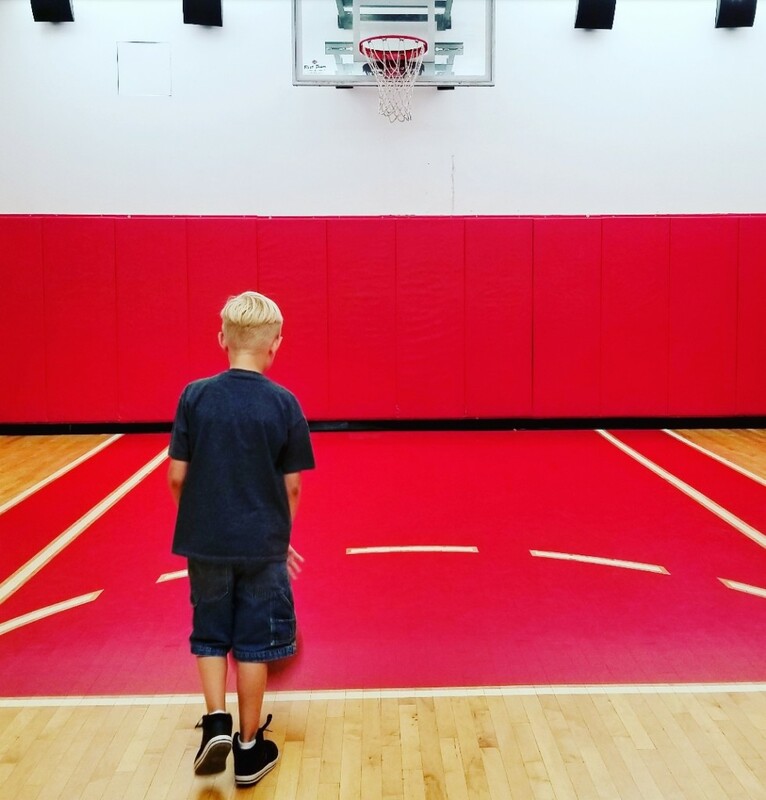 My sports playing boy immediately fell in love with the indoor basketball court and probably could have spent all evening practicing for the upcoming basketball season. The hotel also had a large workout room and a game room. 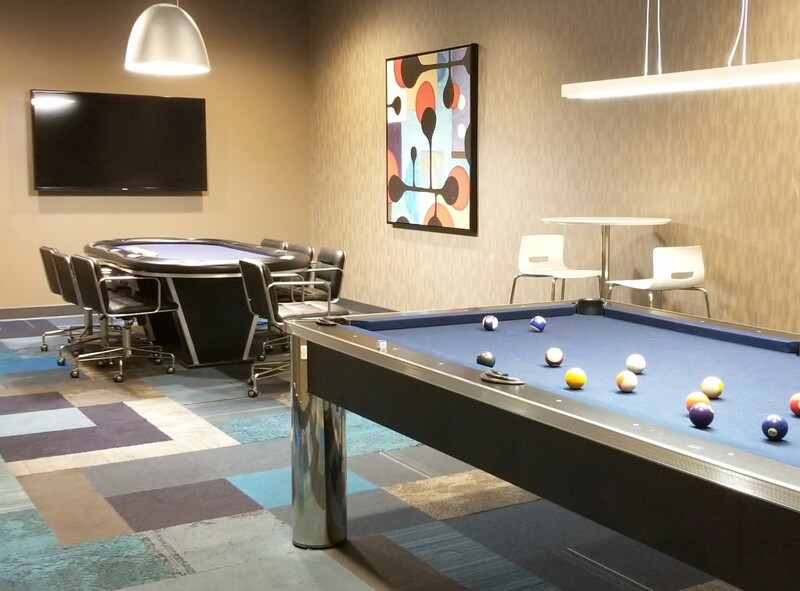 We didn’t use the workout room but the boys did enjoy playing a game of pool in the game room. 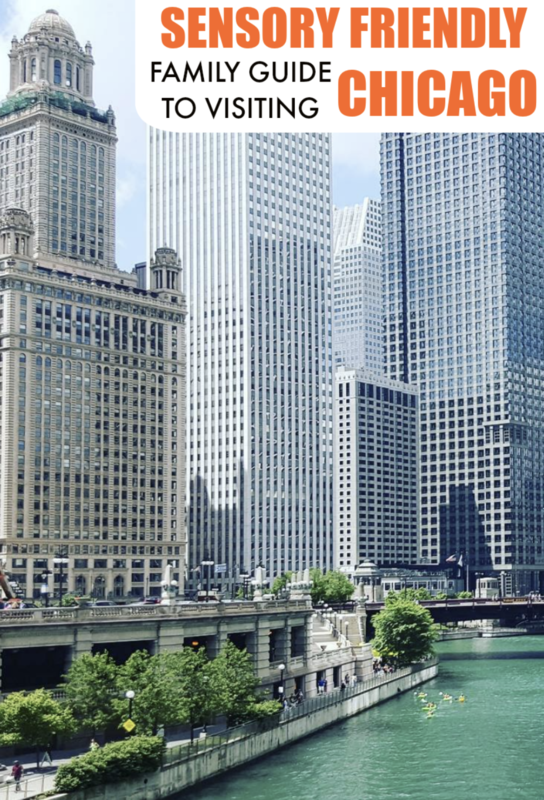 After a busy weekend of enjoying the hotel amenities and exploring all that Chicago has to offer we ended the weekend with brunch at Filini, the hotel’s restaurant. 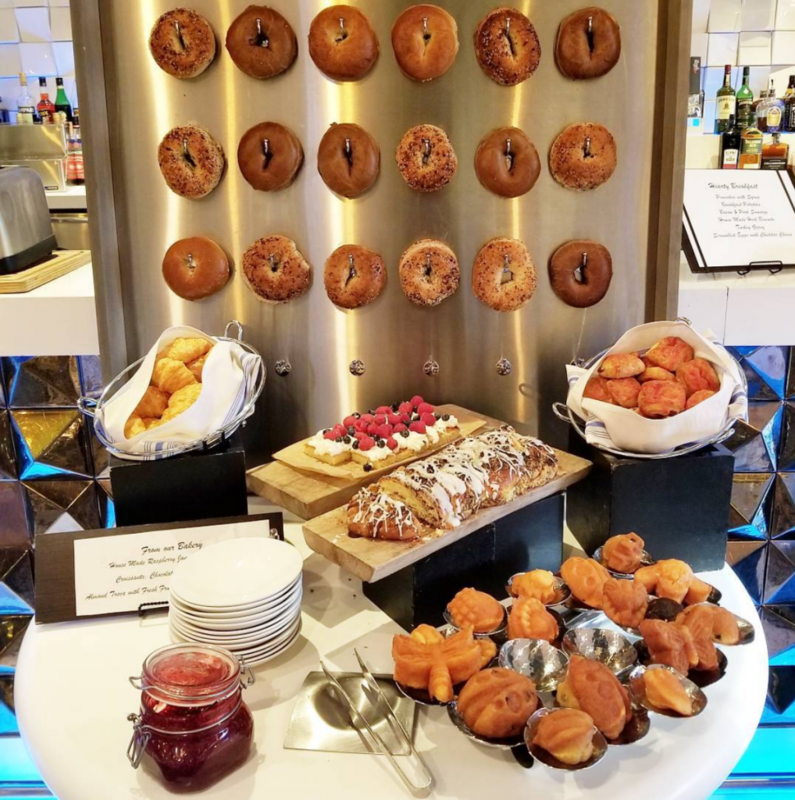 There was such a great variety and all of our favorite foods, from made-to-order omelets to delicious pastries, all beautifully displayed. If you are looking for a winter getaway, look no further than the “wavy hotel” as my kids like to call it. 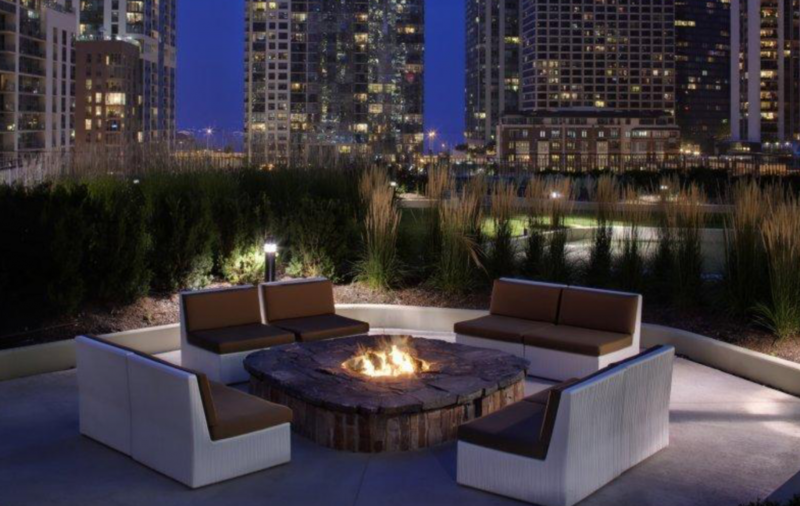 The Radisson Blu Aqua is a wonderful place to stay no matter the season! You can learn more and make reservations online here. Does your family enjoy staycations? Thanks to Visit Fort Wayne for hosting my family on this press trip. Last month we took a short trip to Fort Wayne, Indiana. Despite being just a few hours away from the Chicago area (where I have lived most of my life), I had never visited Fort Wayne before. 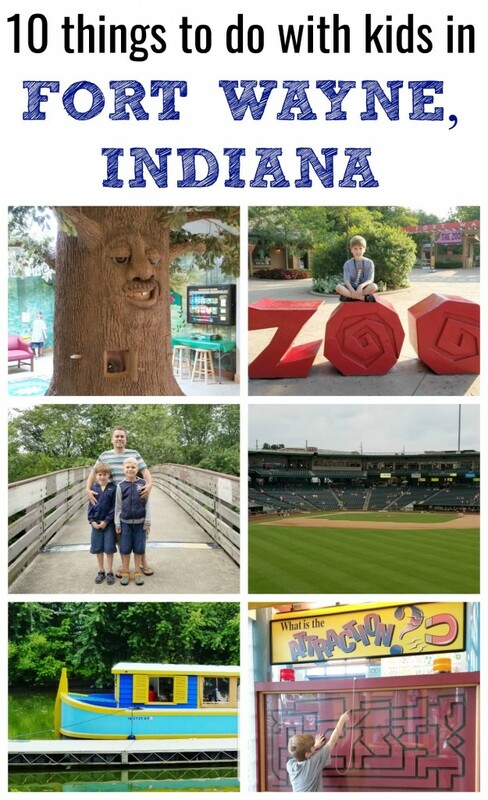 I discovered that there is so much for families to do in Fort Wayne and wanted to share some of my family’s favorite activities from our trip! Out of the dozen or so zoos that I have visited around the US, the Fort Wayne Children’s Zoo is by far my favorite. I loved how this zoo was more of an immersive experience than just looking at animals on display like we typically do at zoos. The zoo is split into regions like the African Journey Safari Trail, the Australian Adventure and the Indonesian Rain Forest. They also have rides you can go on like the Sky Safari (where you can get a bird’s eye view of the animals in the African Journey exhibit), the Crocodile Creek adventure ride canoe boats, and the Z.O.&O. RAILROAD train that takes you around the zoo. Learn more about the Fort Wayne Children’s Zoo here. We love discovering new playgrounds in the towns we visit and my boys were very impressed with the children’s playground at the Bob Arnold Northside Park. The playground has an area for little ones as well as a larger structure for 5-12 year olds. Science was never my favorite subject in school but Science Central has over 130 hands-on exhibits that teach science concepts in an engaging way. From learning about the world in the 3-D Science on a Sphere exhibit to exploring water flow at the large water table, children will have a lot of fun playing at Science Central. The Yummi Bunni is THE place to get ice cream in Fort Wayne. They offer ice cream in cups or their signature Yummi Bun (which is basically a donut). 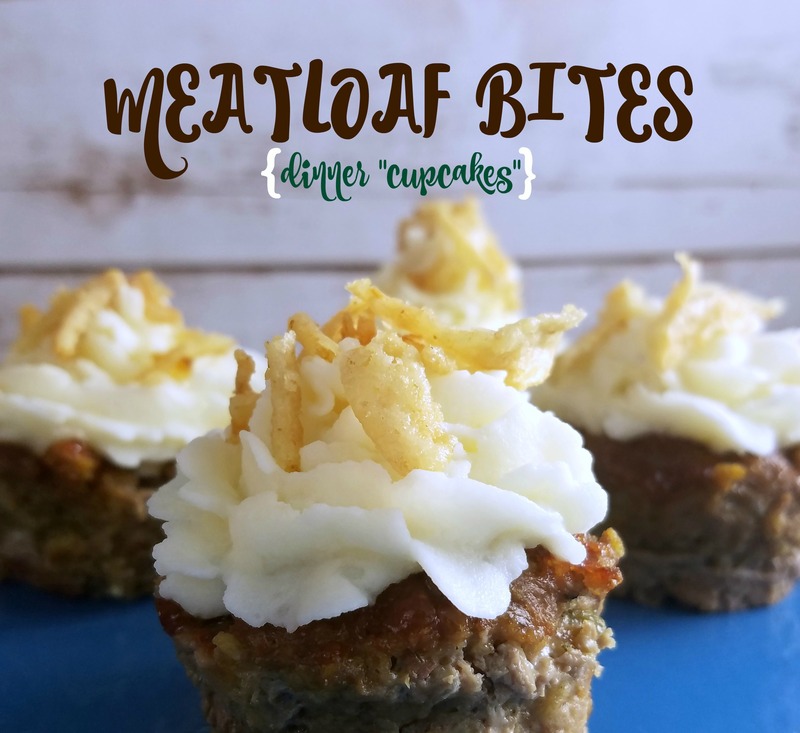 They have new flavors weekly and also offer gluten free and vegan options. (I had soy ice cream for the first time and it was delicious!) Make sure to snap a pic of your kids in front of the selfie wall for a cute vacation memento. I wasn’t sure if my boys were going to enjoy a botanical conservatory or if this was more geared towards adults but my kids ended up having tons of fun here. I felt like the entire conservatory was developed with families in mind and that bringing young children was not only welcome but encouraged there. They have a discovery corner located right outside the lobby that has stories and activities related to a monthly theme. The area is geared towards grades pre-k through K but my 3rd and 4th graders enjoyed it as well! While walking between the three indoor gardens the boys discovered activities along the way including an “underground” slide, a little pretend market and some building activities. We also enjoyed looking at the hundreds of plants as we walked around the indoor and outdoor gardens. Learn more about the Botanical Conservatory here. Fort Wayne has a number of pools and splash pads around town that are open during the warmer months but we enjoyed swimming at our hotel’s pool. We stayed at the Hilton Fort Wayne located at the Grand Wayne convention center and it had an indoor pool (which is a must-have when traveling with kids in my opinion). The pool area had lots of windows with views of the city and the hotel was close to everything which was convenient. If you are traveling to Fort Wayne with a little baseball fan you’ll want to see if the TinCaps are playing a home game while you are in town. (They play during the spring and summer months.) Besides baseball, visitors will enjoy Parkview Field- where the TinCaps play- because it is a beautiful stadium with a great variety of foods at reasonable prices. Unfortunately, we didn’t get to stay for a whole game because it started raining an hour in but it was fun while we were there. Fort Wayne is home to over 90 miles of trails. We climbed the set of steps near the Old Fort which gave us a great view of the river from above and was the perfect spot to snap a photo. Here’s a trail map so you can find the trail for your family to explore. Did you know that Fort Wayne has three rivers? I was surprised to learn this! The best way to experience the riverfront area is via boat. There are a number of tours but we went on Sweet Breeze, Fort Wayne’s authentic 1840s canal boat replica, where we learned about Fort Wayne’s history and future plans for the riverbank area. Learn about all the riverboat rides here. There’s lots more to explore in Fort Wayne and we enjoyed walking around the downtown area. You can visit the Fort Wayne Museum of Art or catch a show at The Embassy Theatre. Overall, we had a great trip to Fort Wayne, Indiana! If you live there, or have visited in the past, I’d love to hear what other things you think we should add to our list to do next time. If you’ve never visited what things do you think your family would enjoy doing in Fort Wayne? 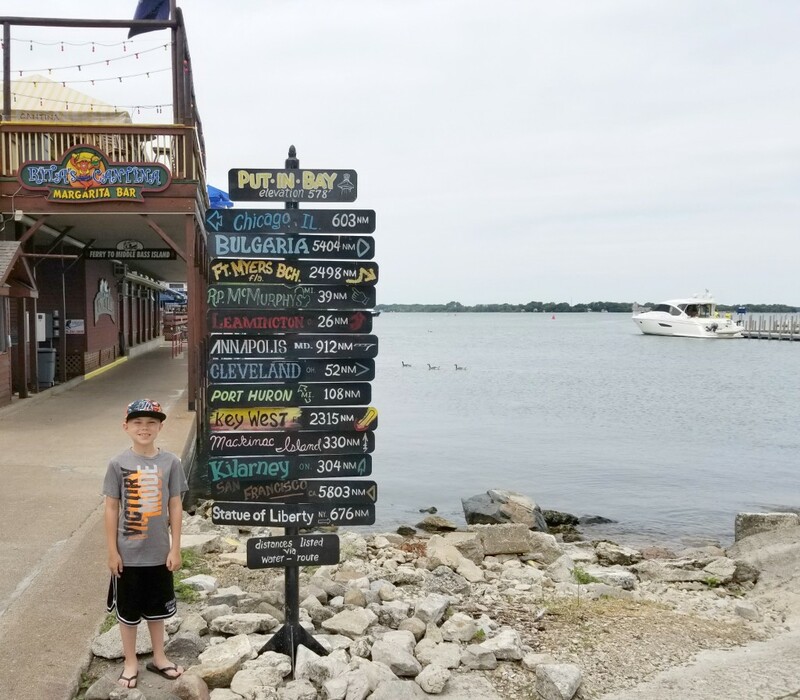 We spent Memorial Day weekend in Lake Geneva, Wisconsin and there was a lot more to do with kids than I thought there was going to be. It’s definitely a town I’d recommend if you are looking for a quick vacation this summer! 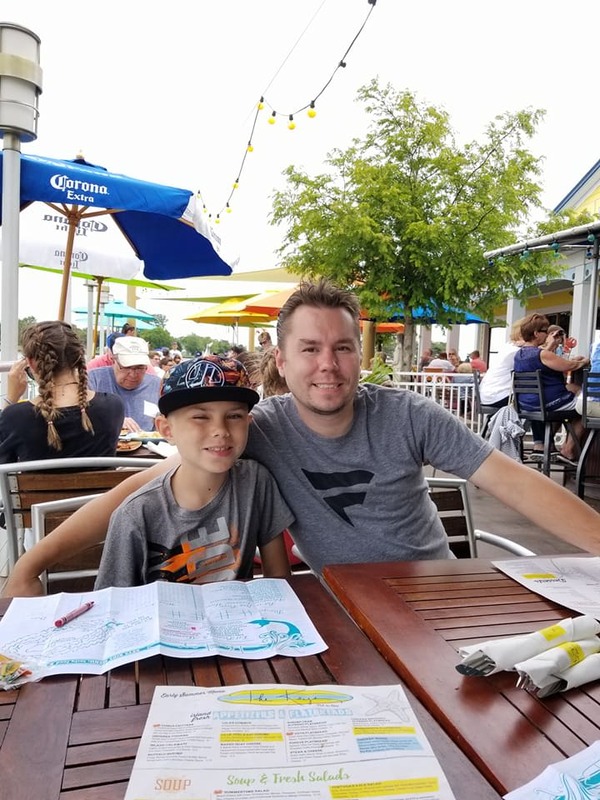 I wanted to share some of our favorite activities that we did while we were there along with suggesting a great place to stay and a couple places you may want to eat at. This 18-hole miniature golf course is fairly inexpensive fun in a touristy town. The course was nice and well-maintained though the waterfall seemed to be under construction or not turned on yet for the season (which didn’t impact play in any way). The course only had a few other families using it while we were there so it was quiet. We enjoyed playing and had a lot of laughs when a couple of our balls ended up in the water and we had to try to fish them out. Guests staying at Timber Ridge Lodge can enjoy full access to Moose Mountain Falls indoor waterpark and the outdoor pool areas. The indoor waterpark is perfect for rainy day fun and easily won the “favorite thing to do” title from the boys. I like that the indoor waterpark was split in to two pools- one that was great for babies and toddlers and one for everyone else. The deeper one had basketball hoops on one end and Jacob ended up spending most his time there. There are two large water slides- a tube slide and a raft slide- that the boys loved going down along with two smaller slides. There was also an “adults only” hot tub (though I didn’t have a chance to try it out) and a lazy river. The outdoor pool areas are a little small in my opinion but if it’s nice out you probably don’t want to be sitting around the hotel anyway! Parents of young children will appreciate that the little kids have a separate pool area to play in. I’m going to be honest- visiting the history museum wasn’t on my list of things to-do when I headed to Lake Geneva. We had arrived at our lunch restaurant an hour before it opened so we had some free time and the museum happened to be across the street so we decided to go. I’m so glad we did! The boys, especially Lucas, really liked exploring it and I enjoyed checking it out as well. The first part was a “Main Street” that had replica homes you could go in to see how people lived during certain time periods. There are also a number of exhibits including a shoe exhibit, military exhibit, and train exhibit. Kids get in free to this museum and to make it even more fun for them, make sure to ask for a BINGO game they can play while walking through the museum! One of my favorite things to do is walk around towns that have cute little downtown areas and Lake Geneva’s did not disappoint. Downtown Lake Geneva is fairly large with lots of great stores to check out and plenty of restaurants with outdoor seating areas. The boys enjoyed playing Pokemon Go as we explored the area. They also discovered a comic book store and a children’s book store which they thought were awesome. 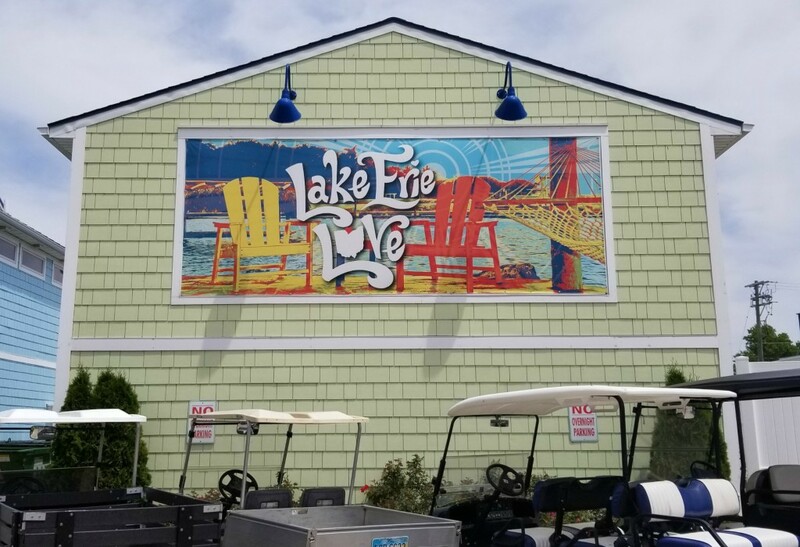 I enjoyed shopping at all of the stores with “lake life” decor as I imagined furnishing my dream lake home. Another great thing about the downtown area was that parking was so cheap! It was only $1 an hour to park downtown which will shock those from nearby cities like Chicago or Milwaukee. Located right in the heart of downtown Lake Geneva, Riviera Beach provides the perfect way to cool off when it’s hot outside. Though the city was packed last weekend, the beach itself wasn’t as crowded as I thought it would be. The beach area was clean and had lifeguards watching the water. There was a charge to get in the beach area but, if you are looking to save money and don’t care about getting in the water, there is a large grassy area right behind the beach that’s great for picnics and doesn’t cost anything to enjoy. Make sure to stop in the adjacent Riviera Pavilion for some ice cream, too! If you are traveling via car make sure to stop by the nearby Jelly Belly Factory for a free tour and candy. 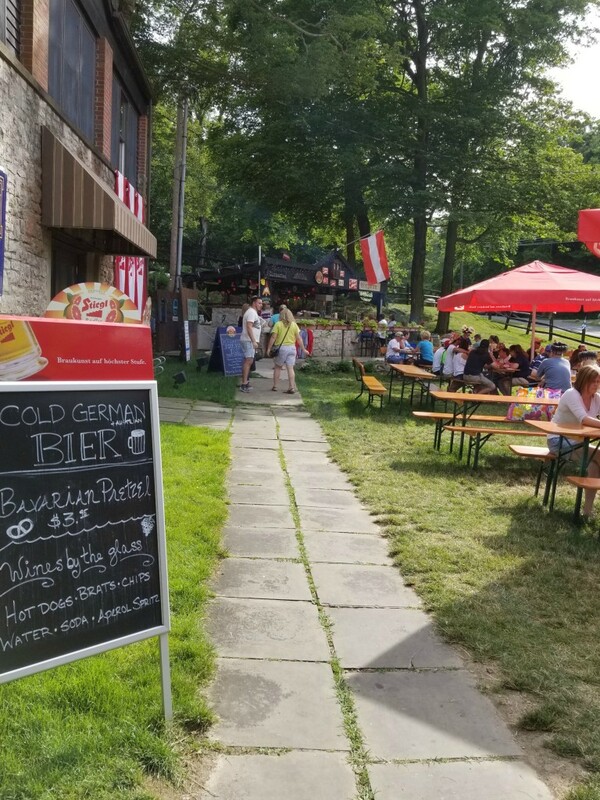 The Mars Cheese Castle is a great place to stop for lunch and some snacks on your way to Lake Geneva as well! We ate at a handful of restaurants but a couple I’d suggest are Carvetti’s Bar & Grill and Popeye’s. Carvetti’s has a nice patio area and, best of all, kids eat free with the purchase of an adult meal! Popeye’s is right across from the beach and has nice lake views. I loved sitting in their outdoor table area and their food was really good. Have you visited Lake Geneva before? 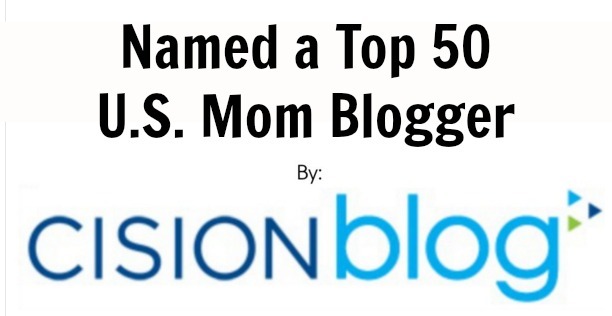 If so, I’d love to hear about your favorite family-friendly activities! Thanks to Dubuque CVB for hosting me in their town. 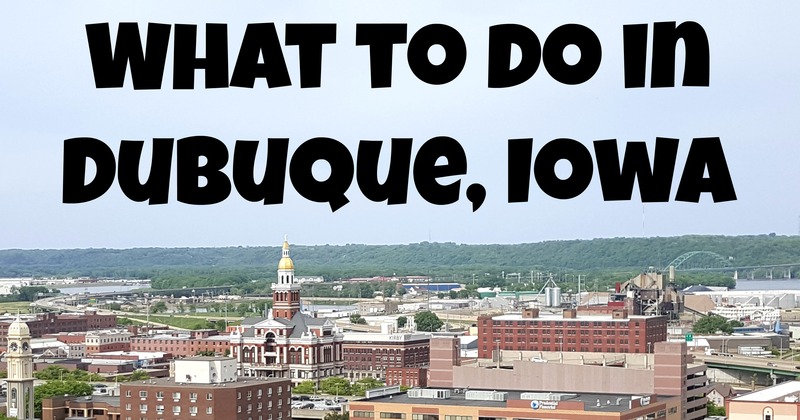 I have shared about where to stay and where to eat in Dubuque, Iowa and now I’m sharing about what there is for families to do in Dubuque. 1. Splash around in the indoor water park at Grand Harbor Resort & Waterpark. Whether your little ones like the splash pad area, the water slides, or the big bucket that dumps water on them, they’ll have a great time at this waterpark. 2. Steer a boat at the National Mississippi River Museum & Aquarium. Kids will enjoy pretending to be a boat captain as they steer their boat around a little pool. 3. Take a ride on the Fenelon Place Elevator. Get a bird’s eye view of downtown Dubuque and the Mississippi River from the top of the hill and enjoy the ride as you go up and down on the world’s shortest, steepest elevator ride. 4. Visit the Dinosaur exhibit, Dinosaurs Unearthed, at National Mississippi River Museum & Aquarium (now through 10/10/16). Dinosaur loving kids will get a kick out of seeing life-sized animatronic dinosaurs, along with fossil and skeleton specimens. 5. Have lunch by the water and watch boats go by. There are a number of restaurants that are near the water but my favorite was The Yardarm. 6. Families with children 10 years and older can go ziplining at Sky Tours Zip Line. Experience all 9 ziplines on a 2-hour guided tour of historic Union Park. Learn all about it in this video from Angie’s Lens. 7. Take a tour of the William M. Black, an old Mississippi River dredging boat. Explore where the crew worked, slept, ate and lived and imagine with your children what life must have been like for that crew. This boat is part of The National Mississippi River Museum & Aquarium and is located outside nearby. The tour admission is included in your ticket price. 8. Walk around downtown Dubuque, where there are a number of stores, and the Port area which features a riverwalk. It’s the perfect way to spend a sunny, warm day. 9. Visit The National Mississippi River Museum & Aquarium. Look at the animals, get up close to animals in the “touch tank”, learn about the river and more! 10. Not in the city, but nearby, baseball fans and movie buffs will love visiting the baseball field where the movie Field of Dreams was filmed. Families can even play baseball on the field! Have anything to add? If so, I’d love to hear about what you enjoy doing in Dubuque so I can add it to my list of things to do next time I’m in town. If you are looking for a family friendly town that also has some history, you’ll want to visit Springfield, Missouri. I recently went there with my mom and kids on a sponsored press trip and found it was the perfect mix of learning and fun. Here are some of the things our family enjoyed doing while we were there. Andy B’s Restaurant & Entertainment center is a huge building filled with lots for families to do. With 21 lanes of traditional bowling, 10 VIB (Very Important Bowler) bowling lanes, an underground laser tag arena designed to look, feel and sound like an abandoned mine, a large arcade game room with every game you could want, and a full-service Restaurant and Bar, you’ll never run out of fun things to do at Andy B’s. We enjoyed bowling together at Andy B’s. They have a really updated system with an interactive scoring system that allows you to customize the game for your group and adds a lot more fun to the bowling game. While we bowled we ordered food and they had a great deal going on where you received a free game card with every item ordered from their special menu. After bowling the kids played laser tag and some video games and arcade games for tickets. We all had a great time there! Discovery Center of Springfield (DCS) is an interactive, hands-on museum committed to inspiring people of all ages with a life-long love of learning and an appreciation of the world and our place in it. Kids will have such a fun time playing with the exhibits that they will forget they are learning! Our favorite part of the museum was the area that explored careers. The kids loved pretending to do a newscast on television where they sat behind a desk just like a real news anchor would and talked to a camera that was recording them. They could pretend to be weathermen and give the weather report using a green screen as well. Another area they enjoyed was the grocery store where they took turns shopping and being the cashier. Other areas they could pretend in included a doctor’s office, a newspaper office, a construction zone and a theater among about a dozen other areas. Askinosie Chocolate is a small batch bean to bar chocolate manufacturer sourcing 100% of their beans directly from the farmers. At Askinosie Chocolate they hold the craft and quality of their chocolate in almost equal balance with doing as much good as they can in the world. They have a great business model and improve the communities of both where they are located and the farmer’s where they get the beans from. They offer tours of their factory where people can learn about how and why they make chocolate, their cocoa origins, their farmer partners, and their engagement in their community and their origin communities. Learn more about Askinosie Chocolate Tours here. Wilson’s Creek was the first major Civil War battle fought west of the Mississippi River, and the site of the death of Nathaniel Lyon, the first Union general killed in action. The costly Southern victory on August 10, 1861, focused national attention on the war in Missouri. Visitors can visit this National Park to check out their Wilson’s Creek museum and then take a self-guided tour of the battlefield by vehicle. Along the tour you can stop at eight places that are considered significant battle-related locations including The Ray House, dating from the 1850s, which served as a temporary field hospital for Southern soldiers following the battle. 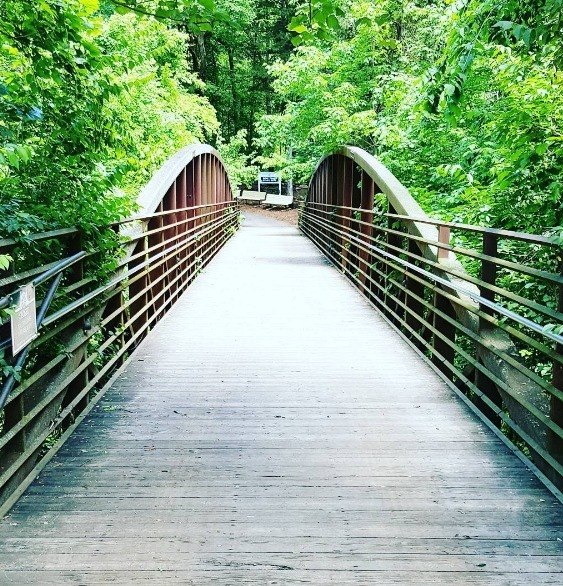 There are five walking trails off the tour road, varying in length from 1/4 to 3/4 of a mile and a seven mile trail system for horseback riding and hiking. I honestly wasn’t sure how much the boys would enjoy the tour, because they haven’t learned about the war in school yet, but they seemed to really like it. We were lucky to meet some costumed characters at one of the stops that showed us what the dress looked like during the Civil War, what types of things they would have carried and what their guns looked like. We even had a private demonstration of how they would have loaded and shot their guns which I think Jacob really enjoyed. America’s Incredible Pizza Company has been voted as the #1 Family Entertainment Center in the world, twice, and it’s easy to see why! Along with a delicious buffet they have plenty for the family to do. They have a large trampoline area, arcade games, go karts, rides, laser tag, an XD theater, bowling, rides, and an area just for little ones. The boys loved playing the arcade games of course. We also raced go karts. Jacob was tall enough to drive his own go kart so it was him against Lucas and I and I loved seeing his smile as he was racing. We all enjoyed the buffet which had a great salad bar, pizza selection, and variety of desserts. Fantastic Caverns is America’s only ride-through cave. It was discovered in 1862 by an Ozarks farmer -or more precisely, by his dog, who crawled through an entrance. It wasn’t until five years later that the first exploration took place: 12 women from Springfield, answering a newspaper ad seeking explorers, ventured into the cave. Because the beauty of Fantastic Caverns is vulnerable, the Cave is toured in jeep-drawn trams. Since you ride all of the way through, you experience the magnitude, the stillness, and the splendor of Fantastic Caverns while preserving its natural features. I loved being able to sit down and enjoy a ride through the cave. It was a much better way to explore it than having to walk through because you could really focus on looking at it the whole time instead of having to watch where you were walking. The boys loved when they turned the lights off and we were in complete silence and darkness for a bit. Fun Acre has an 18 hole mini golf course and batting cages. Though it is not the most well kept mini golf course we’ve ever played on, it is the cheapest which is why I’m adding it to my list. Adults play for $2.50, kids ages 5-11 play for $1.75 and children 4 and under are free. We had a lot of fun playing mini-golf here! We loved staying at this hotel. They have a great outdoor pool that the kids loved playing in. Read my whole review of our stay here. Two other places that looked fun but we didn’t explore much were Ms. Gilmore’s Tea Room and Bass Pro Shops. The tea room was next door to a restaurant we ate at and I walked through it briefly. It was so adorable and the perfect place to have afternoon tea with your child! Bass Pro Shops is also a place I’d recommend. We have one near us and there is always a lot to do there. This one in Springfield is the original Bass Pro Shops store and probably three times the size of other Bass Pro Shops. They are even getting an aquarium soon which I thought was awesome! Overall we enjoyed all the things we did while in Springfield, Missouri. Stay tuned for my post on the best places to eat while you are there! I recently had the chance to visit Bowling Green, Kentucky as a guest of the CVB and it was very different from what I was expecting. Instead of a small farming community I found a town very similar to my own Chicago suburb that had plenty of things to do for the whole family. Bowling Green is an easy drive from Chicago and worth the short hour drive if you will be nearby in Nashville. You’ll want to be geared for fun when you visit! The first thing that comes to mind when many hear “Bowling Green” is the National Corvette Museum and it’s definitely a popular tourist stop. The 115,000 sq. ft. building houses more than 80 Corvette models and one-of-a-kind concept cars spanning the history of Corvette. Made even more famous by the Corvette sink-hole, they now have a special exhibit about that national phenomenon that caused millions of dollars in damage to a number of rare corvettes. I found it interesting to look at. Those with young kids will want to visit the car themed playroom at the museum. They also have a Corvette Cafe so you can have lunch in the retro diner while you are at the museum, too. Speaking of cars, Bowling Green is home to the Beech Bend Raceway Park. Check the schedule online to see if anything is going on while you are there. I was lucky enough to visit during the Annual NMCA Bluegrass Nationals and got to see all the drag racing cars up close and personal, along with having the chance to talk to some of the drag racers themselves. I never watched drag racing before but I found it fascinating to watch and enjoyed listening to how passionate the drivers are. Want to spend even more time outside? Mammoth Cave National Park is a free U.S. national park. You can walk or bike around the park but the most popular thing to do is take a cave tour. The park encompasses portions of Mammoth Cave, the longest cave system known in the world at over 400 miles of cave that has been discovered. There are a variety of cave tours but I went on one called the “Frozen Niagara” that was one of the easier tours, prefect for families. Another cave in Bowling Green is the Lost River Cave which offers a boat tour of their cave. It was fun to explore the cave by boat on their tour which lasted about 45 minutes. There are lots of other activities to do with kids here including walking along trails, playing bird bingo, cooling off at the natural spring, treasure mining, visiting the butterfly habitat and playing at their Nature Explore Outdoor Classroom. Once you work up an appetite at Lost River Cave you’ll want to stop by the nearby restaurant, Lost River Pizza Co, for lunch. Though most well-known for their pizza, make sure to get an appetizer to go with it, like their spicy fried pickles, Brown Ale Shrooms, or wings. For kids there are plenty of affordable options. Don’t forget dessert! Head on over to Chaney’s Dairy Barn for some homemade ice cream. Named #1 ice cream in Kentucky by USA Today, you will see why after just one taste! There are a variety of flavors from Bourbon Crunch to Mocha Moo. I tried their peanut butter fudge swirl in a waffle cone and it was delicious. 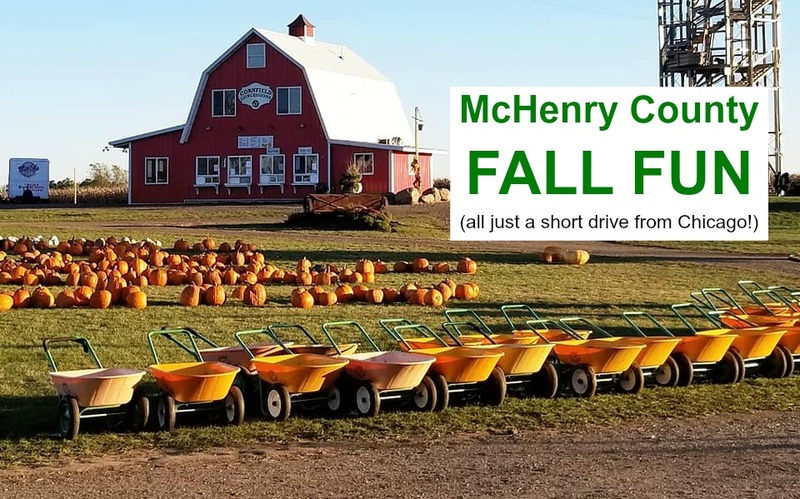 During the summer they also host events like farm tours and outdoor “MOOvie” nights so be sure to check their calendar to see what’s going on during your visit. Have baseball fans in your home? Head out to a Hot Rods baseball game while you are in town. They also have a great kid’s play area, with a playground and carousel, for kids to play. They have theme nights and other fun events so again, check the calendar to see what’s happening. I went to a game on Star Wars night and it was fun to see so many in costumes. Within walking distance of the baseball stadium is the Railpark & Train Museum. The train museum is in a former station and has historical exhibits, a model railroad & vintage car tours. It was interesting to walk through the train cars and imagine what it would have been like to travel in them years ago. I also enjoyed checking out their downtown area. Fountain Square Park in the middle of their downtown is a beautiful place to sit and relax. They also had a number of storefronts, including Mary Jane’s Chocolates, for those of you who love chocolates. If you like to stop at Farmer’s Markets, it should be noted that Bowling Green has a large Farmer’s Market that’s open a couple times a week year-round. One other place I enjoyed eating while in Bowling Green was Montana Grille (not to be confused with the chain restaurant that has a similar name). They had lots to choose from on the menu and I loved the cabin-like atmosphere. Favorites include their Bourbon filet, Spike’s Mean Beans and Jalapeno Cornbread. As you can see, there are tons of great places to play and eat in Bowling Green. You’ll need a place to sleep as well and I’d recommend staying at the Hilton Garden Inn. It’s a well-taken care of hotel with spacious guest rooms, nice outdoor patio areas and a delicious breakfast selection. 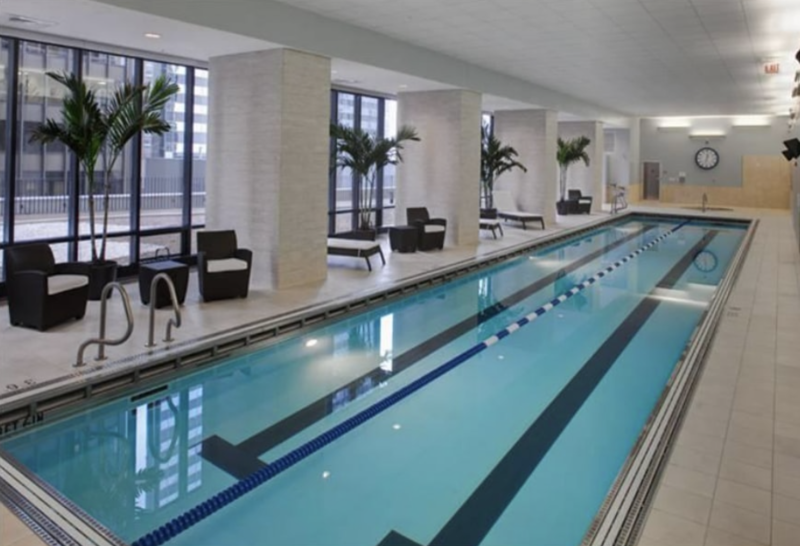 The hotel also has an indoor pool as well which I know is always on my boys’ wish list when it comes to accommodations. 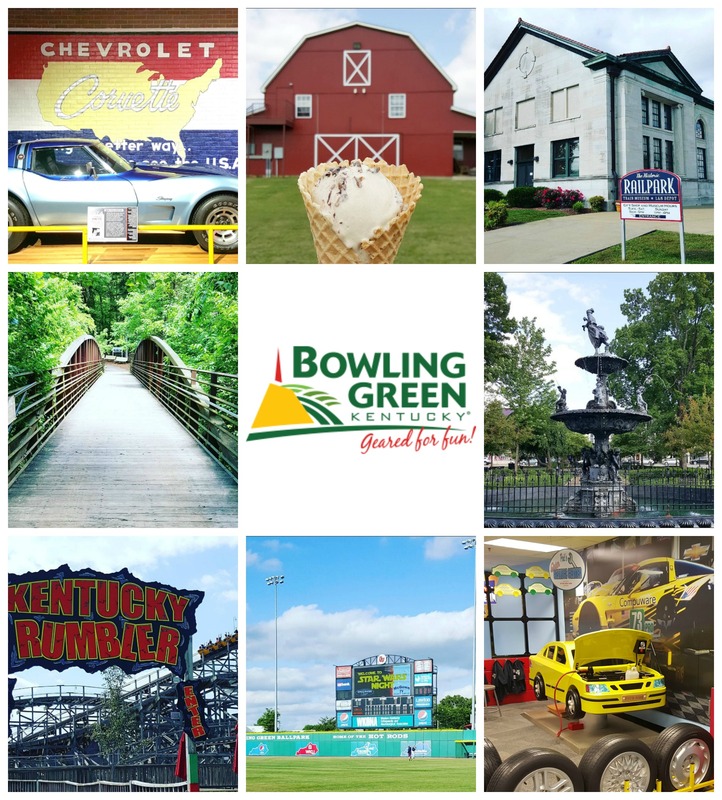 Bowling Green, Kentucky has plenty of fun for the whole family! 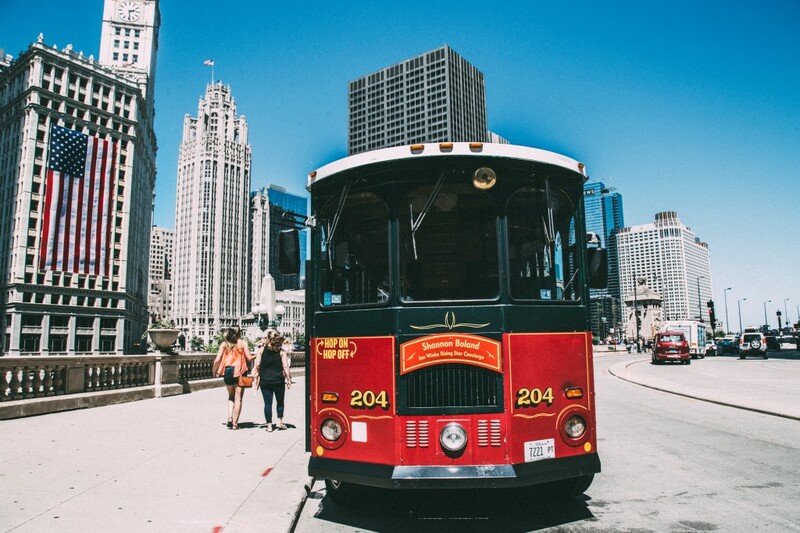 What are you most looking forward to doing on your visit? A few weeks ago I visited Springfield, Missouri with my mom and children. Visiting as a guest of the CVB, we received a complimentary stay at the historic Best Western Route 66 Rail Haven Motel. According to their website, the Best Western Route 66 Rail Haven motel features eight original sandstone cottages that were built in 1938, just 12 years after Route 66 was established in Springfield as one of the main routes that leads to the west coast. Honestly, I wasn’t sure what to expect because of the motel’s age and the fact that it was a chain motel but I was pleasantly surprised when we got there. The staff was extremely kind and helpful, there were fresh cookies available when we checked in and our room was nice and clean. They also provided many great amenities like free wi-fi, parking, complimentary breakfast and a “to go” snack bag upon checkout. The first thing we noticed upon pulling into the parking lot was the vintage charm of the hotel. I loved the ambiance. There is an old Ford Crown Victoria out in front along with a phone booth and some old gas pumps. The lobby of the motel also had a vintage feel with the cafe area bringing me back to the sock hop era. The breakfast buffet area was modernized though. In the mornings you could make your own Belgium waffle and they had a variety of toppings to choose from. Other options included a number of hot breakfast foods (like eggs, sausage and biscuits with gravy), cereal and bakery items. There was also a fridge with waters, yogurts and fruit. For drinks they had a hot drink machine (which my boys loved getting hot chocolate from) and a juice machine. Overall, I thought the selection for a complimentary breakfast was great. Once we checked in and grabbed our freshly baked cookies we headed to our room which was just a short drive away. The room itself was typically furnished with two beds, a table and chairs and a dresser with a large flat screen TV on it. The dresser had both a minifridge and microwave which I love because it helps to save on food when you can bring your own simple lunches and dinners to heat up or store your leftovers when you order too much from the restaurant. The bathroom was a bit small but had a bathtub which the boys enjoyed splashing in. There was also a counter with a large mirror outside the bathroom which provided extra space and helped keep things moving in the mornings with everyone sharing one bathroom trying to get ready. Speaking of splashing, the boys were the first ones in the motel’s pool this season. Though it was a warm day the water was still chilly since it had just been filled but that didn’t stop the boys from playing in it. I sat under a pergola while I watched the boys swim as my mom took a nap in the deck chair beside me. I liked that the motel had a lot of outdoor space. Besides the pool area there was a large covered area with tables and chairs, outdoor seating outside the lobby and chairs outside each room. It is the perfect place to relax when you aren’t exploring Springfield, Missouri! I am thankful to have had the chance to be invited on a press trip to Azul Beach Hotel in Riviera Maya, Mexico. If your family is looking for your next vacation spot, read on below for all the slime-tastic fun that you can experience in a beautiful all-inclusive resort. Azul Beach Hotel by Karisma is a beachfront oasis that caters to families and couples who desire a more intimate experience. The resort has 148 deluxe rooms and suites (including some swim-up rooms), six restaurants, five pools, four bars, a Nickelodeon themed kids club and a spa. They feature a Gourmet Inclusive® Experience which means gourmet meals, premium drinks and excellent service from beach butlers to room service. Azul Beach Hotel is situated on the beautiful Mexican Caribbean in the heart of Riviera Maya. The hotel is located 20 minutes south of Cancun International Airport and 35 minutes south of downtown Cancun. The suite was large and spacious as you can see in the video above. I loved the large bathtub, the comfy beds, the sitting area and the view from my balcony. Karisma Hotels pride themselves on offering The Gourmet Inclusive® experience throughout their resorts. Azul Beach has five restaurants. 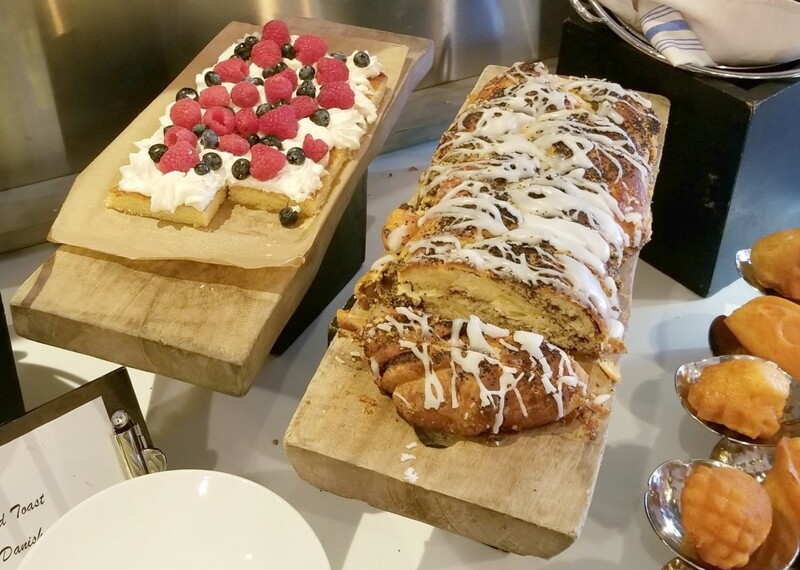 Blue serves a variety of world cuisines along with a delicious assortment of food at their breakfast buffet. Chil offers an array of burgers, salads, wraps and tacos for lunch and has a patio that overlooks the water. Latino offers a variety of a la carte dinner options, all with a latin flair. Tainan is the place to go if you are in the mood for Asian food, including my favorite, Sushi. Roma is the resort’s Italian restaurant, serving large portions at dinner-time. The resort also has four bars. Agavero, their Tequila bar, serves 30 different tequilas served straight, frozen or mixed. Aquanox bar and Chil bar serve my favorite fruity drinks. Try a Miami Vice while you are there (it’s a layered strawberry daquiri and pina colada drink). They also have a swim-up bar called Bubbles which lets you enjoy your drink without even getting out of the pool! Along with the restaurants and bars they offer room service and service at the beach. One of my favorite times on the trip was sitting on the beach in a cabana with some of the other bloggers and getting drinks and lunch delivered while we enjoyed time by the ocean. I loved vacationing alongside SpongeBob, Dora, and the Teenage Mutant Ninja Turtles. We had breakfast with the characters, found them walking around the resort during the day and danced with them at night. We even got special Nickelodeon goodies delivered to our room. Azul Beach features a couple places just for the kids. The Azulitos Playhouse by Nickelodeon has themed activities planned for every day so that parents are free to enjoy some kid-free time. For children 4 to 12 years old, the My Gym Center at Azulitos Playhouse offers daily classes and programs designed to help children develop physically, cognitively and emotionally. And, in true Nickelodeon fashion, I got slimed. Green goo was dumped all over me and I was brought back to my childhood. Another thing that sets Karisma hotels apart is that they really think about the needs of families with little ones and do everything they can to make the trip as smooth as possible. From having baby food readily available to providing baby monitors for parents who want to relax on their deck while baby is napping, they provide so many amenities so you don’t have to pack them. Azul Beach features a number of activities for adults such as yoga, Tequila tastings, live music and beach volleyball. They also have excursions people can sign up for, like swimming with the dolphins or scuba diving. 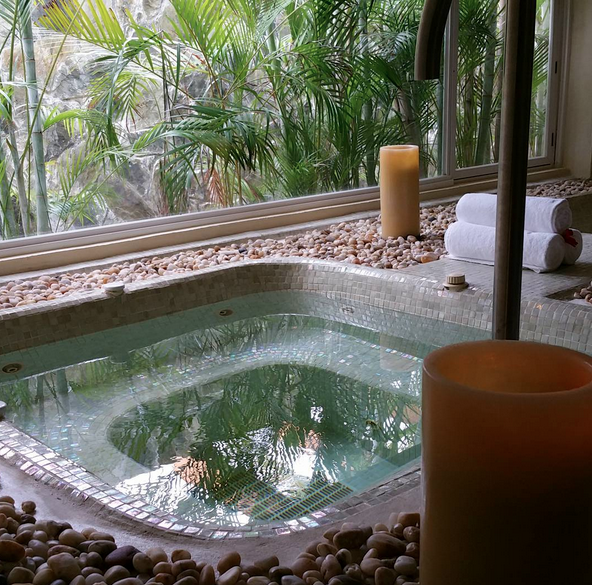 The spa at Azul Beach is the perfect place to relax while getting treated to a massage, manicure, or one of their other services. Adults would even enjoy just relaxing while they soaked in the tub right in their room. While in Mexico I had a chance to visit Azul Sensatori hotel which was nearby. Here are some pictures from my visit there! Looking for your next family escape? You will find it at Azul Beach!